On Saturday 5th April the excitement isn't reserved for the track and the Grand National as StanJames are giving you 10 free Spins, no deposit required on any of our Bonus Games ('Touch' Games) on Mobile or Tablet. 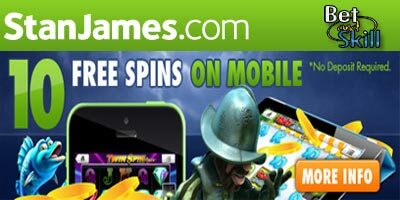 Find below how to receive your mobile casino free spins at StanJames.com. So whether you've already journeyed through el Dorado in Gonzo's Quest whilst on the bus, or joined Cartman and Co in South Park whilst doing the weekly shop, there's never been a better time to try STANJAMES Mobile Casino. Enjoy your 10 free spins! 1. This promotion is only available from 00:00-23:59 Saturday 5th April 2014 (GMT). (Promotional Period). 4. The free spins are only available to customers whose moble device uses Android 4.1 or higher and iOS 6 or higher. 5. The free spins will be available on games under the 'Bonus Games' tab on mobile or tablet. A full list of qualifying games is as follows: Big Bang Touch, Disco Spins Touch, Fisticuffs Touch, Flowers Touch, Frankenstein Touch, Fruit Shop Touch, Gonzos Quest Touch, Jack Hammer Touch, Jackhammer 2 Touch, Lucky Angler Touch, Magic Portals Touch, Mythic maiden Touch, Reel Rush Touch, South Park Touch, Starburst Touch, Subtopia Touch, Twin Spin Touch, Victorious Touch. 6. The free spins will be credited automatically upon launch of any qualifying game listed in term 5. 7. The maximum free spin award is 10 free spins and no cash alternative will be offered. 8. Any winnings from the free spins will go into your bonus balance and must be wagered thirty (30) times on any game/s listed in term 5. 9. Once you have played the free spins, any cash balance that is already in your account will be used before the bonus balance. 10. Bonus funds will automatically expire 3 days after you have claimed the free spins. 11. Any winnings from the free spins of £0.25 or less will be automatically forfeited; also any bonus funds of £0.25 or less will be forfeited.